Oh, readers. You are just the best. Can I count the ways your comments cheered me up this weekend? I cannot. They made me giggle and shudder and feel a lot less alone in the apartment. Thank you so much for all your help and sympathy - it was far better than the smelling salts I thought I'd have pressed to my nose all weekend in despair. A phone call made to the exterminator (who still hasn't shown up, by the way), watching Ratatouille, and spending a lot of time outside with friends also made me feel far more serene about the fuzzy interloper who knocked me sideways on Friday. I'll admit, I haven't bought traps just yet (I am a coward, that's all there is to it), because part of me is hoping that the little guy was scared stiff by my scream and is cowering in the walls until we move out in 29 days. Pretty please? Because, in other, far more important news, I spent the rest of the weekend basking in the warm glow of self-satisfaction. Pourquoi, you might ask? Well, ladies and gentlemen, I made my own butter. And let me tell you, there is absolutely nothing that is more astonishingly satisfying than that. Oh sure, baking your own bread certainly makes you feel all capable and strong and resourceful, even, but churning your own butter? It tops that, I swear. Daniel Patterson, he of the water-poached scrambled eggs, wrote about the glories of making your own butter in yesterday's New York Times Magazine. 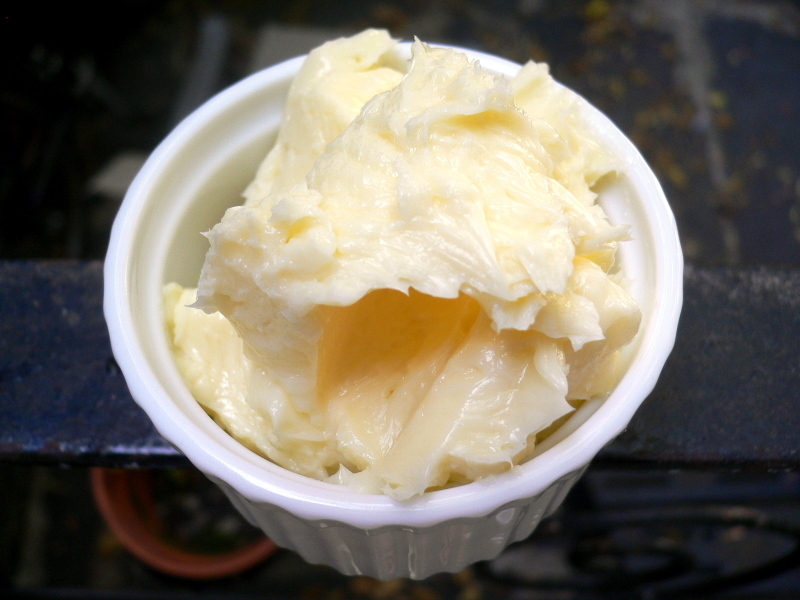 It all seemed rather serendipitous, because I'd been absolutely itching to make Melissa's cultured butter for days. If you didn't already know it, can I tell you how easy it is? It is so easy. So ridiculously easy. I drained the buttermilk from the butter, then kneaded the butter in the strainer until it was silky and dense and most of the liquid had been squeezed out of it. I packed the butter in little ramekins and refrigerated it until it was firm but still spreadable. 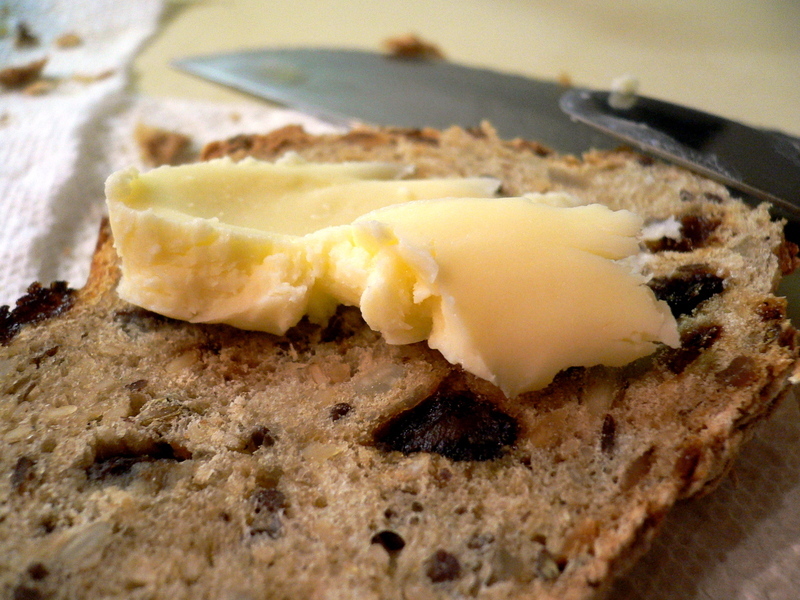 Spread thickly on a slice of raisin-oatmeal bread, it was a good afternoon snack. I'll be honest, the fact that I'd made that butter myself was largely why I was so enchanted with it. The butter was very mild, and tasted like the pure, clean version of the American butter widely available in supermarkets everywhere. It didn't have much of a flavor profile. I put a knife-tip of the butter on my tongue and could taste the sweet cream briefly, but the flavor evaporated in seconds. The mouthfeel was lovely - cold and creamy - but this wasn't the kind of butter I'd be excited to eat at a restaurant (or frankly, even for breakfast, because truthfully, I'm not really a butter girl, except when I'm in Berlin and can eat Lurpak on Schwarzbrot to my heart's content, though I did use it in the tomato sauce for the tuna meatballs, Marcella's famous one with butter and onion). So all of this means that later this week, I'll go back to the kitchen counter armed with another bottle of cream and a dollop of yogurt to try my hand at Melissa's recipe for cultured butter. I'm thinking that, on fire-roasted corn at our Fourth of July barbecue, it should taste pretty good, right? 1. Pour the cream into the bowl of an electric mixer fitted with a whisk. Tightly cover the top of the bowl with plastic wrap and start mixer on medium-high speed. The cream will go through the whipped stage, thicken further and then change color from off-white to pale yellow; this will take at least 5 to 8 minutes. When it starts to look pebbly, it’s almost done. After another minute the butter will separate, causing the liquid to splash against the plastic wrap. At this point stop the mixer. 2. Set a strainer over a bowl. Pour the contents of the mixer into the strainer and let the buttermilk drain through. Strain the buttermilk again, this time through a fine-mesh sieve set over a small bowl; set aside. 3. Keeping the butter in the strainer set over the first bowl, knead it to consolidate the remaining liquid and fat and expel the rest of the buttermilk. Knead until the texture is dense and creamy, about 5 minutes. Strain the excess liquid into the buttermilk. Refrigerate the buttermilk. 4. Mix salt into the butter, if you want. Transfer to an airtight container and refrigerate.